Puzzle games have really upped the ante in recent years to add challenge and tension to the gaming experience. Time limits, move limits, stars to earn, and points to accrue all say, “Sure you can win, but can you win the best?" There’s nothing inherently wrong with these mechanics. When employed well—and not just to sell packs of hints—they can make puzzle games more fun. Sometimes, however, you don’t want to worry about moves and stars and points and how long it takes you. This is where minimalist puzzle games find their niche. They set aside the quest to find the very best solution and challenge you to find any solution. This week’s freshly released Neo Angle ($1.99) is a minimalist puzzle game and well worth a look. Neo Angle is the latest title from indie developer Dropout Games, the makers of Blyss ($0.99), which still owns a well-earned place in my iPhone’s puzzle folder. Their new offering is once again a simple and intuitive, yet challenging puzzler. 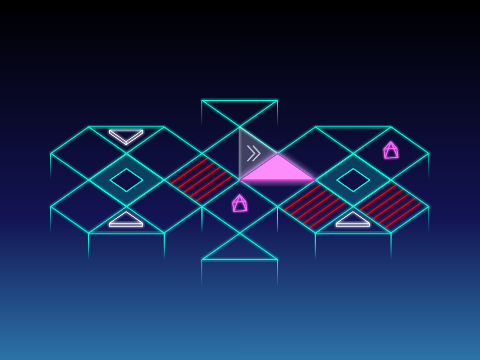 In it you flip a bright neon triangle—seriously, it’s bright, you won’t miss it—through a maze of squares and seek to disarm roadblocks and traps, travel through portals (I assume through both time and space), swing around on a rotating square, and grab a number of rotating pyramids before ending up at your final destination. Makes total sense, right? Ok, it is a bit abstract and such games are tough to put into words, so check out this GIF and I’ll spare you another thousand of them trying to explain it better. Neo Angle was created as an homage to the days of Miami Vice, the Pet Shop Boys, and giant clocks as fashion accessories…yes, the 1980s. This retro theme is supported by a synthesizer-laden soundtrack and neon-colored graphics reminiscent of the signs behind Tom Cruise in 80’s flick Cocktail. It’s bright and stays on script when it comes to the theme, but it won’t cause your eyeballs to cry out for mercy. Gameplay is minimalistic, as promised, it’s just you and the puzzle with none of the aforementioned stars to earn or times to beat. Your only job is to collect all the spinning pyramids and get that bright triangle to the exit without getting boxed into a corner. This is easier said than done and naturally the difficulty ramps up as you progress through the game’s many levels. New mechanics are introduced and layered on top of each other as you go. The game’s difficulty is set just right, letting you ease into it before ramping up the challenge. The harder levels become an intriguing game of trial and error that is both relaxing and fun. My sole complaint is the lack of an undo button to take back your last move. An errant flip of the triangle can easily force a restart, which is a real bummer when you are deep into a tough level. Neo Angle supplies just the right mix of relaxation, challenge, and fun. Its 80’s theme is cool without distracting from the gameplay. If you’re a fan of puzzle games in general, and especially the minimalist niche, picking this one up is a risk-free decision.